FORBIDDEN KNOWLEDGE? WELL NOT ANY LONGER. Even Tucker Carlson can’t say enough about this “new” news. Either the media is distracting us from some far more important topics, or they’re setting the public up using UFOs for some reason. Regardless, this isn’t “news” since millions of people have been seeing them and recording their sightings going back hundreds, if not thousands of years; myself included. Late in the afternoon on September 30, 1979, my wife Norma and our nearly 1 year old son Atom, along with myself and our two cats were at anchor aboard “godot” in Hanalei Bay on the island of Kauai. We were situated approximately where you see us in the photo, but on that day the clouds shrouding the mountain extended farther down as I’ve indicated in the photo. We were below deck as it all began. People on some of the other boats at anchor started screaming and shouting and we immediately rushed topside. Looking shoreward, right at about the tip of the left hand arrow (and about the size of the arrowhead itself) was a bright orange hemisphere, flat on the bottom with a perfect dome above. It was slowly coming directly at us while gradually gaining altitude. By the time it passed over our masthead at about 500 ft, and Norma and I had turned now looking seaward, another deafening crescendo arose from behind us as people screamed and pointed again at a second craft emerging from beneath the cloud. We saw four of these craft that day, in broad daylight, along with hundreds of other people. They cruised over our boats one after another traveling no more than 25 mph in complete silence at an altitude of no more than four to five hundred feet. They were in formation and separated by about a minute’s time. I got a very good look at them. They were about 150 feet in diameter and half that in height. There was a definite metallic-like structure that could be seen despite what appeared to be a surface layer of brilliant orange plasma. The next day hundreds of people were still in shock, some in denial, some crying. I listened to the radio all thru that night and the next day; checked all the newspapers; not a word was to be found about what happened in Hanalei. 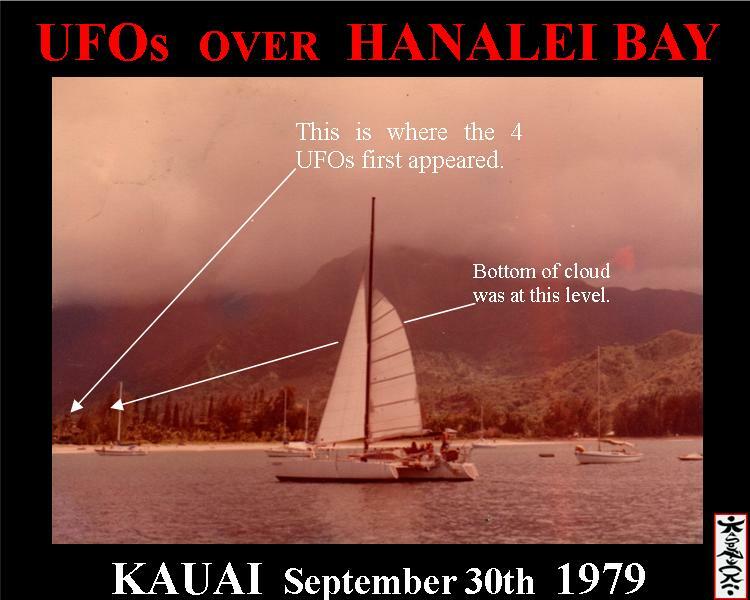 You’d think with Barking Sands and the Pacific Missile Range and all their sophisticated military radar and tracking equipment (RIGHT ON THE OTHER SIDE OF THAT MOUNTAIN) that they would have seen, tracked, and intercepted these strange visitors. The military had plenty of time to do this since we watched the four of them for another 15 minutes as they slowly disappeared over the horizon never gaining any appreciable altitude or speed. This was a day one never forgets. My life’s view of our reality, and my life itself was forever changed from that moment forth. Perhaps one of you too was there that day, or you know someone who was. In any event, I’m not alone in recognizing “old news” when I see it. Long ago I learned that ‘the Truth is out there”. . . and I do believe as they say that “the Truth will set you free”.